Warpage occurs when the shape of the final product deviates from the shape of the tool cavity; sometimes warpage is so slight it is still “within spec” and not a functional or aesthetic problem. In other cases, function and fit are compromised and the part or product must be rejected. Warpage can result from one or several variances that may occur during the injection-molding process. However, application of scientific molding principles, combined with a deep understanding of material science and plastic flow behavior, can eliminate this problem. Temperature differences are the main cause of warpage — whatever variances contribute to these unwanted temperature differences are the production parameters that need to be addressed. These include moisture in the pellets, improperly designed tooling, incorrect melt or tool temperatures, tool contamination, and inaccurate feeding systems. The cooling system is always critical. A precisely calculated cooling rate must be maintained for uniform cooling and shrinkage; if not, uneven cooling may result in warpage. It is critical to have plenty of cooling channels that are properly located to facilitate even cooling (this can be more challenging in products with complex shapes). The gating system must be properly designed with sufficient gates at the right locations. Another way to even out the cooling process is to make the tool from specialty materials. Alternative materials often have higher thermal conductivities compared to standard steel tooling. Wall thickness can also cause quality control issues; even slight variations in wall thickness can result in uneven cooling, and non-uniform wall thickness can affect shear stress in flowing plastic, promoting warpage. Plastics that are reinforced with glass fiber or other reinforcement materials have greater potential for warping because of inconsistent orientation of the fibers. 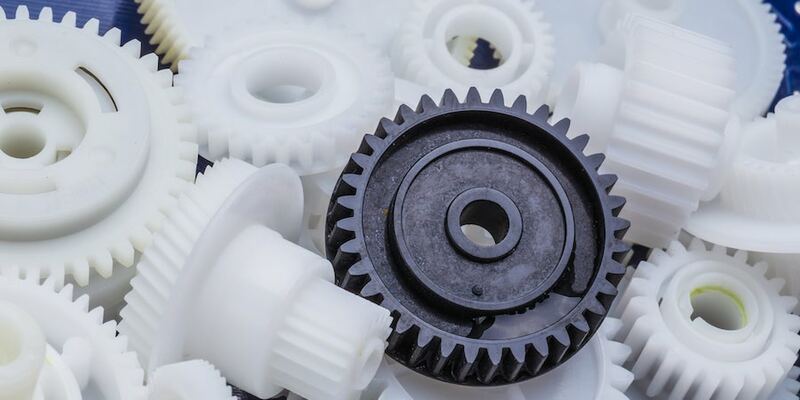 These types of hybrid materials will not flow exactly as homogenous plastics do — therefore injection molders must be highly vigilant when monitoring this process, especially temperature, pressure, rate of flow, and fiber orientation. Higher pressure and flow rate will also produce higher shear rates which can impact molecular orientation, resulting in internal stress, uneven cooling, and warpage. Molten plastic is a liquid that must be carefully monitored through every phase of the injection molding process. It “wants” to follow the path of least resistance; any variances in cooling that have created harder sections have also created channels that can affect the flow and cooling of the remaining molten plastic. When cooling rates are inconsistent this remaining material may not even fully harden, creating temporary soft spots. Or, it may take extremely long to harden, increasing cycle times to unacceptable levels. Mitigating the risks of variances in temperature and materials, as well as improper tooling, is where an injection molder’s experience really comes into play. The risk of warpage must be considered during the earliest project design phases so the proper materials, tool design, settings, and processes can be used and tested to make sure warpage is eliminated from final production. Overcoming the likelihood of warpage and a multitude of other potential quality issues is challenging. However, achieving the right material/tooling combination, reducing the risk varying thermal conditions present, and providing the functionality required for complex injection molded plastic parts is possible. We've developed a whitepaper, Processing High-Temperature and Engineered-Grade Resins, to provide further insights into the multiple factors that need to be considered. Simply click the link below to access your copy today.